The British Railways Headcode ABCs were a very sporadic series, only five editions being produced between 1961 and 1968. 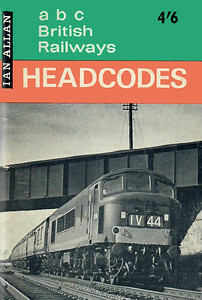 1961 British Railways Headcodes, 1st edition, by M R Bailey, published June 1961, 72pp 2/6, code: 1103/696/100/661. Cover has photo of 31873 & DEMU 1036. Reissued in 1999 (see Section 012). 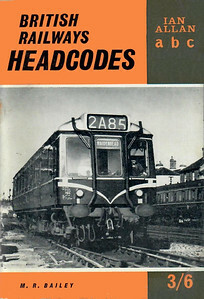 1962 British Railways Headcodes, 2nd edition, by M R Bailey, published February 1962, 96pp 3/6, code: 1142/731/125/262. The cover is a photo of 'Deltic' D9008. 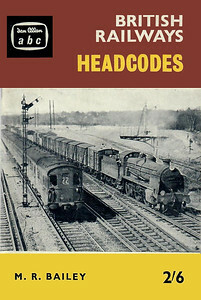 1963 British Railways Headcodes, 3rd edition, by M R Bailey, published March 1963, 105pp 3/6, code: 1213/19/125/363. Cover has a photo of a class 121 'Bubblecar' single-car DMU. 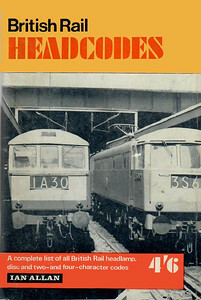 1965 British Railways Headcodes, 4th edition, by M R Bailey, published July 1965, 104pp 4/6, code: 1312/214/GEX/765. Cover photo of a 'Peak' type diesel. 1968 British Rail Headcodes, 5th (final) edition, by M R Bailey, published February 1968, 88pp 4/6, SBN 7110-0000-X, code: 458/GEX/268. Cover photo of electric locos at Euston.